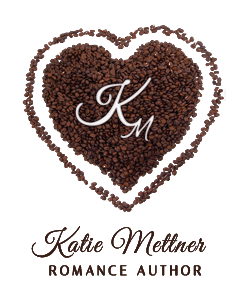 Author Katie Mettner: The Time is Near! 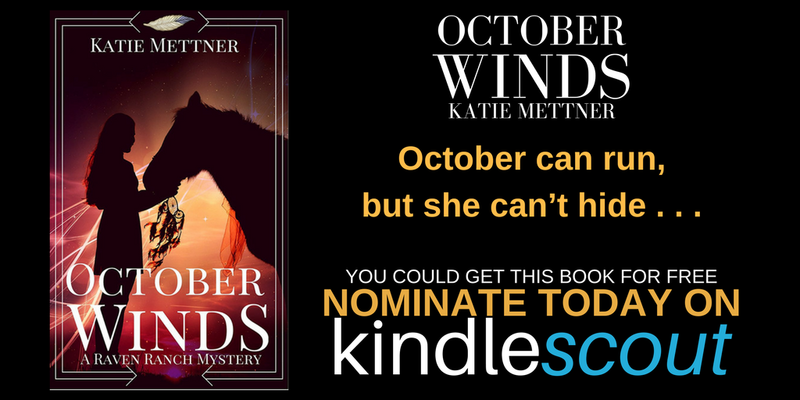 We're two days away from the Kindlescout campaign for October Winds being over! It's hard to believe since it doesn't seem like it's been a month already. I'm asking for the final push to make sure everyone has a chance to nominate her before the campaign ends! I need your help to nominate it and spread the word with your family and friends! (If you don't know how to nominate the book, it's super easy! 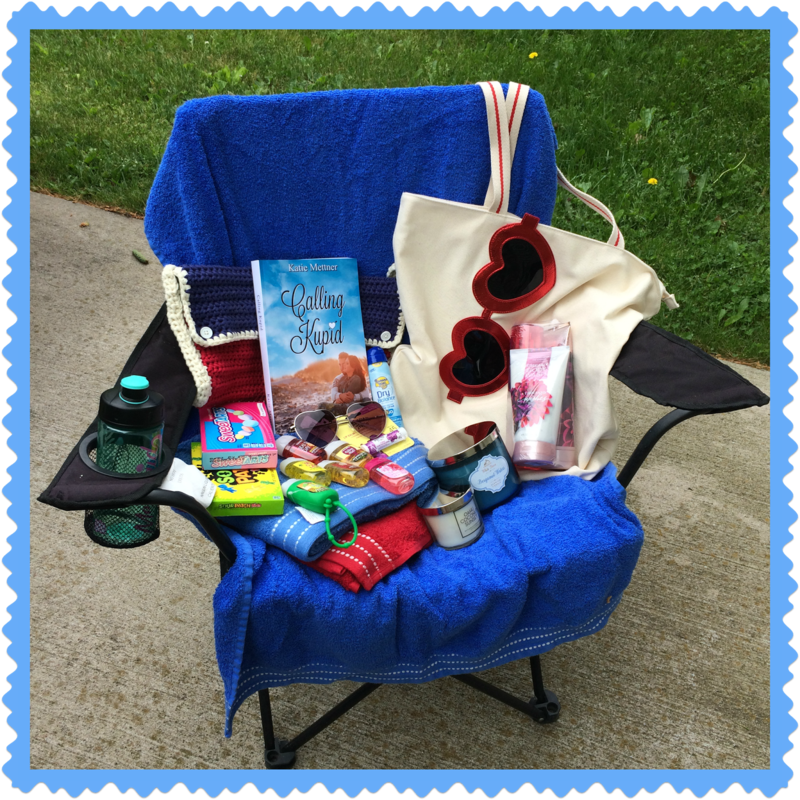 I have full details here) The giveaway goes through tomorrow, and you don't want to miss out on your chance to win it! Scroll down and you'll find the information for that as well. 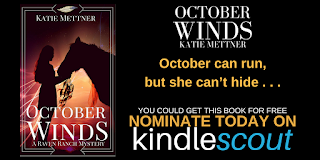 Thanks for going on this Kindlescout journey with me again! October Winds was by far my most successful campaign to date and that's because all of you stepped up and did your part! A sincere, heartfelt thank you from me goes out to you today! 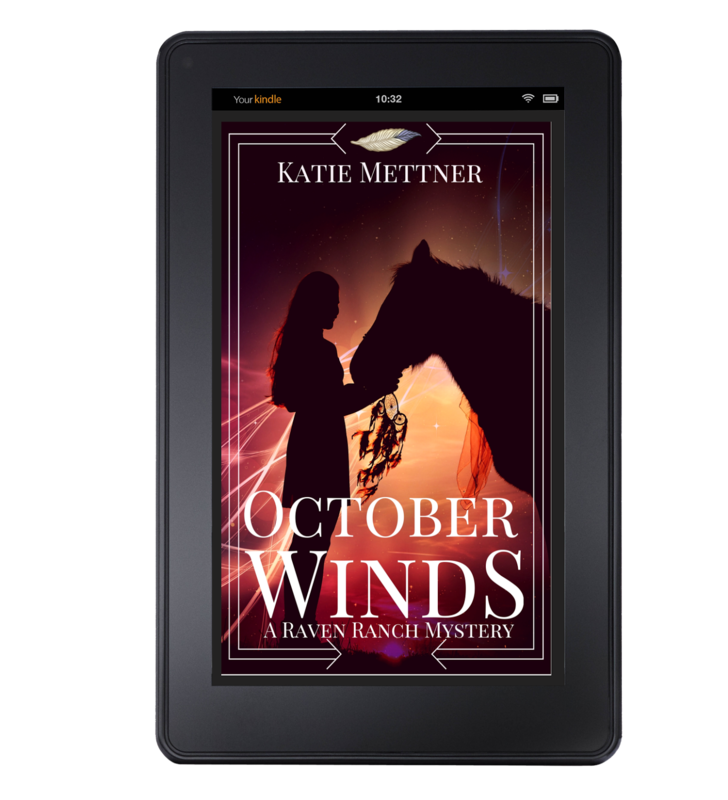 October Halloran hides in plain sight in Zansaville, Minnesota, but Sheriff Jett Raven knows ‘Sarah Banks’ isn’t who she claims to be. 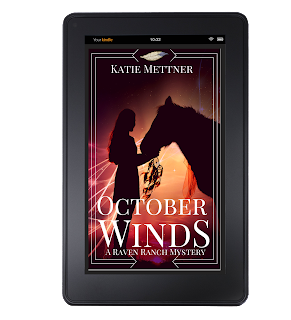 Flying under the radar to keep her past hidden, October is finally happy with her new life, until she stumbles across a dead body. Murdered truckers and attempted kidnappings put October’s life in danger. When the stakes are high, and girls’ lives are on the line, it’s up to October to discover who’s after her and why. It’s up to Jett to keep her alive. I tucked the collar of the men’s Carhartt jacket tighter around my neck. The early October days were warm, but the temps dropped fast once the sun started to set. I wanted nothing more than to get home and start a fire to vanquish the chill, and the things that go bump in the night. To get home, I had two choices: stand here next to this tall and scratchy, yet safe, tree and wait for the dark of night to cover me, or say screw it and run across the road. The first choice assured me I would make it back home with all my belongings, but it would take a few hours. The second choice gave me more variables to work with. I could dart across the road without a soul knowing I'm even out here, or I could saunter into the forest on the other side and be seen, but not raise suspicion. Alternatively, I could get picked up by someone with less than good intentions, or I could get hit by a car in the middle of the road. I tapped my fingers on the tree to the rhythm of the latest pop song they played on an endless loop at work. My feet were tired from working ten hours, and all I wanted to do was take off my boots and rub my toes. My shift started at seven this morning and should have ended at noon, but when Marge failed to show, again, I worked her shift, too. I wasn't about to turn down an extra fifty bucks for the day. Now the sun was starting to set in the west and my stomach growled with hunger. I was starving and couldn’t wait to eat the fruit and nut mix in my pack, which was heavy with my latest treasures as it rested on my feet. The longer I stood pondering my decision, the longer it would take me to sit down to eat. I pondered a lot of things in life often, and rarely did I come to an acceptable conclusion. When you live as I do, you don't have fast cars, cell phones, or electronic planners to keep you busy and in touch with the world. I have plenty of time to ponder and plan, because in my situation a lapse in judgment could mean the end of the road for me. I let out an exhausted sigh and picked up my pack, shifting it across both shoulders evenly. I was too tired to wait, but I still had to hustle and not let anything distract me. I edged closer to the road and listened with a practiced ear for the hum of tires on the concrete. A trained ear could hear a vehicle coming more than a mile away. It would take me less than thirty seconds to cross if I sprinted. I listened a full five minutes anyway, chastising myself. If I had left the first minute, I'd be home by now. Just one more minute, I kept telling myself, one more minute to be sure. I finally willed my feet to step into the open, and I darted across the concrete, heaving a sigh of relief when I made it without a car in sight. Another safe commute to work and back. I laughed aloud at myself. I could say with certainty my commute had a whole different set of frustrations than the usual American’s did. I paused. Were those hooves clomping on the road? I was still exposed as I worked my way down the bank toward the opening in the trees. I wouldn’t be safe until those trees swallowed me for the night. “Do you need help?” a man’s voice asked. I gulped as a horse and rider approached me. I didn’t hear the horse until it was too late, which I found odd, considering I hear everything out of place in my forest. I must be completely exhausted to have missed it. Unless the rider kept the horse in the grass on purpose. I glanced around the road and trees while I searched for a way out of this interaction. “No, no help needed, thanks anyway,” I said, choosing to stroll along the ditch, hoping to get past him and into the forest when he disappeared down the road. I nodded as he spoke, knowing if I agreed with him he would go on his way, and so could I. All I had to do was act cool. “Thanks for the advice; I’m heading home now.” It wasn’t a lie. I was heading home. The intensity of his gaze unnerved me as he sat like a hawk upon the horse. His eyes were dark, and I realized they were the same color as the rich dark chocolate bar Lanny loved to eat at work. His hair, also dark brown, had a swoop which fell across his forehead in a salon cut style. His Columbia parka, well broken-in Levi jeans, and Red Wing boots told me he had money. The expensive saddle he sat in also reinforced his social status. It was handmade and likely set him back a pretty penny. I envied him. Not for the expensive clothes, but for the saddle and the horse. There was nothing as frustrating as knowing you aren’t even scraping by while someone else is living high off the hog, or in this case, horse. I unwittingly stretched my hand out to the powerful animal and it sniffed my fingers, then allowed me to pet its muzzle. “You have a beautiful horse,” I said, yanking my hand back and forcing it to stay in my pocket. I had to escape this good-looking cowboy before I piqued his interest too much. “Matilda, huh? Does she like to waltz?” I asked, trying to keep his interest on the horse and not me. Darlin’? Who is this guy? “I’m Sarah,” I said, not proffering my hand. I lied with practiced authority, because there was no way I would give out my real name. He waved and Matilda clomped off down the shoulder of the road. I marched at a snail’s pace, waiting while they disappeared beyond the horizon before I backtracked into the woods. I didn’t want to stray too far from my entry point or I would be hopelessly lost. As it was, I would have to double back along the tree line once he was gone. Today hadn’t been kind to me and I was glad it was almost over. I slowed my steps further, counting in my head the number of seconds it would take him to disappear completely. I would rather take a few extra steps away from the woods than risk him turning and seeing me entering my secret spot. I focused on the second tally in my head, each step slow, but forward, fifty-one, fifty-two, fifty-three. Only seven more seconds and I should be in the clear. I held my breath, wanting nothing more than to run into the woods now, but it would serve me no purpose. When my counting hit sixty seconds, I swiveled, barely flicking my head backward as I flipped my hair in a typical girly pose, only mine was practiced, and fruitful. As predicted, he had disappeared down the long curving road which leads to Zansaville, Minnesota. Zansaville is nothing more than a pit stop on the highway of life. It’s filled with truck stops, old bars, cheap hotels, and on the hill, some of the most expensive homes in the state. The owners believe they’re safe living in the middle of nowhere, but I know the truth––no one is safe, ever. The thought spurred me into getting off the damn road and into the woods instantly. I spun on my heel and sprinted back the way I came, diving into the forest and plastering myself against a tree as the telltale sound of an 18-wheeler barreled toward me. I barely breathed as I curled around the tree to avoid detection by the bright lights of the growling metal behemoth roaring down the road. I let out a breath when the truck passed, then started down the path to home. I had it memorized, and I jumped from tree to tree in a zigzag pattern I would repeat in reverse on the way out tomorrow morning. Leaving a well-worn path would only serve to draw the curiosity of the occasional geo-catching group or hunter trying to bag a deer. I didn’t want anyone stumbling upon my home unannounced, even though few people would be out here in the middle of nowhere. I gripped my bear spray tightly in my hand, my only protection from an animal who would eat me as a snack and pick his teeth with my bones. The sound of the small stream bubbling told me I was near my humble abode and I sighed with relief. I jumped across the rocks which appeared as if they were randomly placed there by Mother Nature during the ice age. The truth is, I’ve put them there slowly over the past nine months. Why? Because as soon as my foot touched those rocks, I no longer left a path for anyone to follow. Every time I came and went from the forest, I wondered what would happen when the first snow fell. I would have to devise a way to cover my footprints through the snow. I’d been scouring the thrift shop for a pair of used snowshoes, but so far, no luck. Maybe the canopy from the trees prevented snow from falling deeply in this part of the forest. I didn’t know, because this would be the first winter I lived here. One thing was certain, if I didn’t have all my ducks in a row, it would also be my last. It seemed a pair of snowshoes would be imperative to me getting in and out of this place alive every day. Not just alive, but undamaged with nothing broken. I jumped off the last rock and landed squarely in the leaves which had built up on the forest floor. It was too dark to see, and I had to turn my small flashlight on. I prayed no one could see it bobbing through the trees, but falling and breaking a limb would be a disaster. Using the light was worth the risk because I would have warning of any danger waiting for me. Once home, I could get my pack off my back, my boots off my feet, and a fire in the pit. I didn’t mind living a simple life. I suppose because I witnessed firsthand the pitfalls of a complicated life. All I need to do is watch the people coming in and out of the Rest & Ride truck stop, where I work, to know they’re stressed out, keyed up, and in debt. I may not have a lot, but what I have, I own. My camper came into sight, the metal of the roof reflecting the light of the flashlight in my hand. I breathed a sigh of relief. Another safe passage through the woods. I’d worked too hard, and too long, to make this a safe place to live. I wasn’t about to do something stupid and lose it. I always had to be calculated and stay in control. My mind flashed on the pair of eyes I encountered on the road. I didn’t notice then, but my mind’s eye homed in on the earring in his left ear. Was it a horseshoe? I forced myself not to roll my eyes as I approached my camper. I stood next to a tree motionless while I listened. I didn’t want to surprise a bear, wolf, or fox. I had my knife at the ready, my fist grasping it tightly, and my spray in the other hand. It would stop a fox, and a wolf if I got the jump on it, but there would be no way to stop a bear. I stood quietly on the outskirts of the campsite a few minutes longer, then shone the flashlight around. There were no eyes shining in the darkness, so I stepped out and heaved a thankful sigh. Home again, home again, jiggity jog, I said to myself. It was the second memory of my childhood I had today. First, Waltzing Matilda, and now a nursery rhyme. I gave myself a mental shake and reminded my brain those memories don’t come out to play. I unlocked the door to the camper. The factory lock from 1976 no longer worked, but the heavy-duty padlock I had on it sure did. I didn’t want some hunter coming along and thinking he could take shelter inside my home. The padlock and hasp were free from the truck stop. I replaced the padlock on the garbage bins as instructed, and pocketed this one. Reduce, reuse, recycle, right? The camper was dark when I crawled inside and I started my propane lantern so I could put my things away. I swung my bag off my back and let it fall to the floor, which surprisingly had only rotted out in a few places despite being in the woods all these years. Whoever used the camper had gutted everything but the bunks and the bathroom. There was once a working kitchen, but when I found the poor man’s version of a tiny home there was nothing more than a rotted shell, with the appliances long gone. Maybe the last owner took them out for all I know, but the only thing I found in the empty holes were mice nests, sans mice. It took me all summer, and a lot of elbow grease, but I managed to make the eight-foot by five-foot room into a living space. This spring, summer, and fall, I spent most of my time outside, other than sleeping or working on the interior, but once winter hit, I would need this shelter to stay alive. When I found discarded metal shelves in the dumpster at work, I carried them home, a few at a time, and used them to cover the holes in the floor. Then I added a few layers of newspapers, a layer of cardboard, and a discarded remnant of carpet from behind the carpet shop. With the floors completely repaired, I focused on to the walls. A few bundles of newspapers, a lot of duct tape, a pack of survival blankets, and a weekend off, was all I needed to insulate the walls. I used my own body heat to keep myself warm for now, but it wouldn’t be enough to keep from freezing during a Minnesota winter.